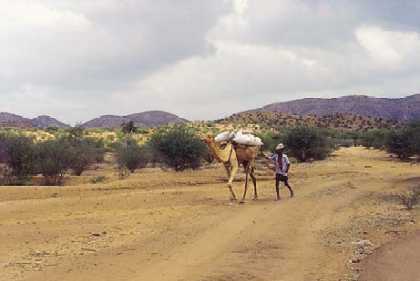 Approximately halfway between Asmara and Massawa lies Ghinda, an interesting village in a little valley that, especially during the first months of the year, is a sharp contrast to the dryness on much of the Asmara plateau, because it traps the prevailing moisture from the coast, resulting in higher rainfall. 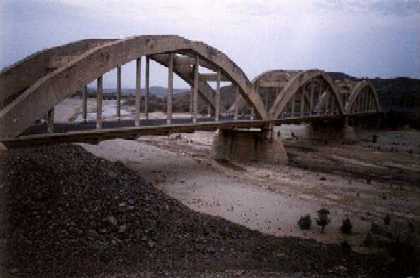 The Asmara - Massawa road turns left into the main street of Ghinda, crossing a river. It was always a favorite spot for Italian residents not least because the rain and fertile soil made it, and still do make it, a major agricultural area. Its green terraced hillsides supply the fruit and vegetable markets of Asmara and Massawa. Ghinda is a popular place to stop on the journey between Massawa and Asmara and travellers usually do so for half an hour for a break. Any of the restaurants opposite the bus stop are worth trying for a meal or refreshments. The town was severely damaged in the war of liberation. the cemetery outside Ghinda contains the bodies of 3500 men and women fighters killed at the Ghinda front in 1990. 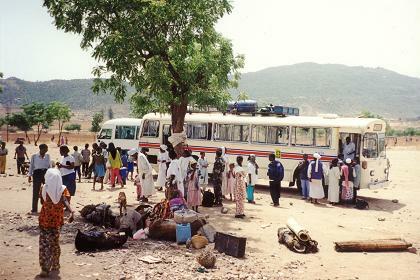 Bus stop in Ghinda. 15 minutes rest and time to have a Coke. 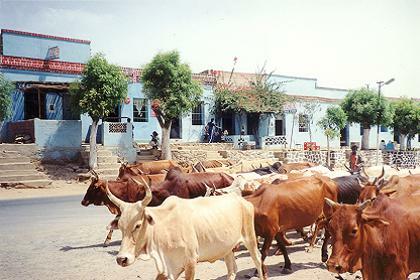 Streetscape of the road through Ghinda. 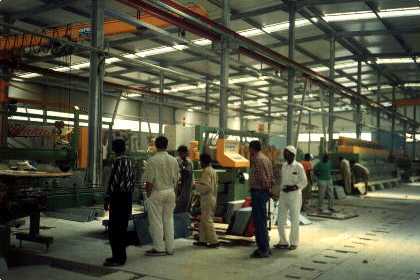 Ghinda granite & marble cuttery. 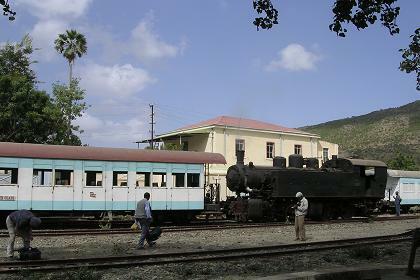 Antique locomotive and railcars at the Ghinda railway station. Not far from Massawa, on the road from Foro to Zula, lie the ruins of Adulis, an ancient Axumite port up to the 7th century, and one of the main archaeological sites in Eritrea. The black basaltic constructions of Adulis lie buried under sand and soil brought down from the agricultural highlands by the Hadas River. 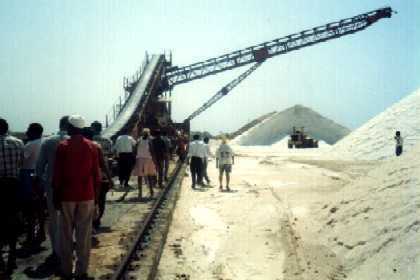 The 1961-91 war completely shut down excavations for 30 years. Before it went into decline, the port of Adulis was one of great significance in Antiquity. It is best known for its role in Axumite trade during the fourth – seventh centuries AD. It served all the major Axumite towns of the interior: Axum, Qohaito, Metera and Keskese, cities that are now only archaeological sites, dotted with fragmented stelae, inscriptions and the remains of palaces and storehouses. Not only did Adulis offer a good harbor on the route to India, but it was a source for commodities such as gum, gold, honey, wax, myrrh, ivory, tortoise-shell and rhinoceros horn. Adulis is referred to as a port, but it is now 4 km from the Gulf of Zula, due to major coastal changes in the area, between the villages of Afta and Zula. In the year A.D. 1 a Greek writer created a sailor's and businessman's travel guide. It described the busy port of Adulis as Axum's chief trade city: "Adulis (is) a fair sized village, from where it is three days' journey to Coloe, an inland town and first market for ivory. From that place to Axum, the city of the people called Axumites, there is a five days' journey more. To that place all ivory is brought from the country beyond the Nile." 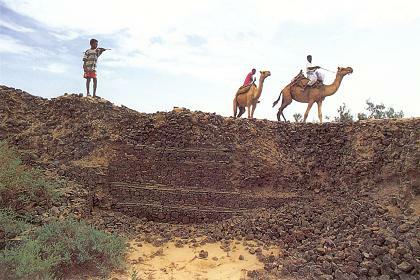 Adulis ruins, Buri Peninsula - Eritrea. 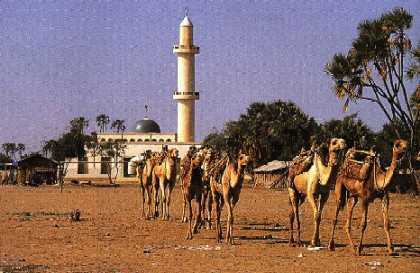 Ages-old camel train ambles past Hirghigo s distinctive minaret. 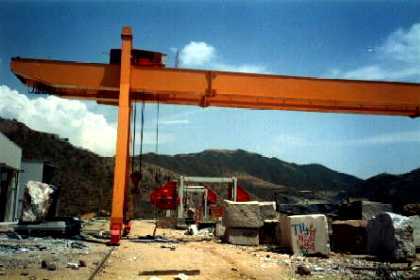 The concrete trestles of the Dogali River bridge on the road to Massawa.